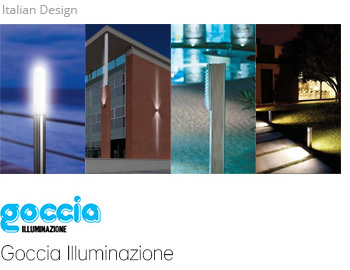 For more than 30 years Goccia Illuminazione has been applying the most innovative methods for the improvement of its products. They have reached a solid and high-level position in the field of exterior lighting equipment. The products are manufactured with constantly updated technologies and are well known in the European markets as well as in many other countries around the world. At their production site of 6500 M2 at Poncarale, Northern Italy, Goccia products are manufactured to the highest quality standards. In 1996 the company obtained the admission to ISO 9002 standards and in 2004 the admission to UNI EN ISO 9001 ed. 2000 standards, in order to guarantee the use of appropriate productive and commercial procedures.